The most remarkable thing about Tina Feyâ€™s SNL skit about Sarah Palinâ€™s notorious Couric interview wasnâ€™t the accuracy of her impersonation. It was the fact that the joke spoke for itself so plainly in the verbatim repetition of Palinâ€™s words. If thereâ€™s a joke in this weekâ€™s film recommendation, itâ€™s of a similar form. 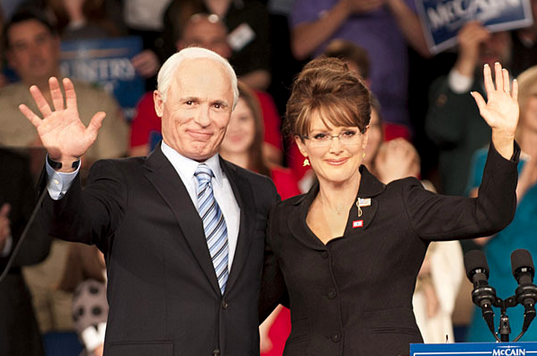 Julianne Moore plays Palin in Game Change, the HBO adaptation of the â€œhigh risk, high rewardâ€ selection of a running mate capable of shoring up the McCain campaignâ€™s lack of popularity with youngerâ€”and especially femaleâ€”voters. 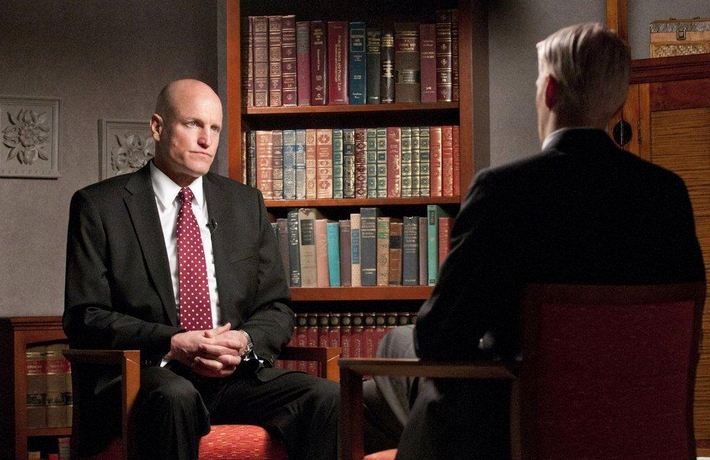 A skin-headed Woody Harrelson plays Steve Schmidt, the campaignâ€™s senior strategist. In a textbook case of the Halo Effect in action, Schmidt champions Palin once her inimitable charm compels him to leave her competence in politics and foreign affairs unquestioned. He easily sells the rest of the team on Palinâ€™s suitability, even over McCainâ€™s preference for Joe Lieberman. Notwithstanding the popularity and momentum gained by Palinâ€™s rousing speech at the RNC upon accepting the nomination, Schmidt soon realizes that Palin is more of a liability than he had anticipated. Before long, the McCain campaign had to grapple with Troopergate, the Couric interview, and Palinâ€™s general inability to differentiate between North and South Korea or between the federal government and the Federal Reserve. She also didnâ€™t handle with much grace the creeping awareness that she had bitten off much, much more than she could chew. At times, she became catatonic; at other times, she was violently resentful at the way she felt treated by the staff. And her petulant outbursts never make clear whether Palin blames it all on herself or the â€œlame-stream mediaâ€ (Harold Pollack is quite right on this one â€“ why a mother to a physically disabled child coined the term â€œlame-stream mediaâ€ just shows what a wasted opportunity Palin was for the country). The two main characters both undergo a sad development throughout the film. Schmidt begins the campaign with ambitions of installing a noble and worthy leader in the Oval Office. But by the end, he happily jettisons that aspiration when he suggests that Palin ought to memorize 25 answers to pre-packaged debate questions, just to forestall the impending catastrophe of the VP debate against Biden. The plan works beautifully, and he oddly appears not so much relieved as he is proud of the Pygmalion heâ€™s helped produce. For her part, Palin also goes through an un-flattering development. She begins as the hockey mom whose principal concerns are understandably with her constituents back home in Alaska. But that admirable concern eventually becomes a parochial distraction from more pressing national matters, and itâ€™s also a leading indicator of Palinâ€™s weakening capacity to cope under the pressures of office. Itâ€™s therefore all the more sad when she concludes the campaign convinced that sheâ€™s outgrown Alaska, as though obscurity doesnâ€™t suit her any more. Even-handedness is never assured in political dramas of this sortâ€”especially when, as here, the wounds of history remain so freshâ€”but Game Change has an air of fairness without flattering any egos. McCain, played by Ed Harris in an uncharacteristically middling performance, declines to intervene once Palinâ€™s incompetence becomes apparent for fear that she may direct her anger toward him. Neither character seems particularly courageous as a result. Nevertheless, both of them inspire considerable sympathy: McCain, for the sense in which he feels authentic disappointment at the way the campaign inspired such vitriol toward Obama among the Republican base; Palin, for the sense in which she ingenuously aspires to being the next Reagan, only to be told that sheâ€™s not a fit successor. On this last point, two of my favorite scenes are close to the very end, when Palin voices her determination to deliver a concession speech alongside McCainâ€™s. Her interactions with McCain as he passes along the torch of the Republican party, and Schmidt as he hopes to keep the honor of politics intact are potent and well-wrought. While McCain encourages Palin to strive for something bigger, Schmidt voices the audienceâ€™s urgent hope that Palin be reminded of her limits. Presumably Schmidtâ€™s guilt from having been the one to champion Palinâ€™s selection all those months earlier leads to this one scene as a great payoff. By a remarkable coincidence, I happened to watch this for the first time two weeks ago. I like your take on the film. I thought Moore really did a super job in this film. It's not an impersonation but a true performance, with a great deal of humanity in it. In the scenes with Palin and her family, we see how humiliating and nasty politics can be, which humanizes Palin in a way real life did not. There are so many movies where the naive newcomer shows up in DC and dominates (Mr. Smith goes…), when the film shows a much more common outcome: The national stage reduces state and local stars to ash. In this modern world of instant gratification, I was able to watch this film within an hour or two of having read your review, and was very glad I did. This is the sort of movie that I wouldn't ordinarily dream of seeking out, but seeing it recommended here, and through the miracle of streaming video, I was able to spend a couple of very enjoyable hours with a very well-made piece of film. I thought Julianne Moore turned in a really masterful performance, which together with the excellent script avoided the obvious temptation in a project like this to make fun of its subject. Easy enough to make fun of Sarah Palin, obviously, but not while also making a good film. I believe you mean Galatea; Pygmalion was the sculptor who created her.